If you missed our June Virtual Book Club, come join us for July! This summer we are hosting a Summer Virtual Book Club with 20+ bloggers Typically we host a Virtual Book Club each month and feature just one book. This summer we will be studying several different authors and we will be showcasing loads of new books! In July we are studying Don & Audrey Wood! Pick your favorite book by Don and Audrey Wood (or a new one you want to check out) and read it with your child or class. Come back and share it with us as part of a big Don and Audrey Wood blog hop on Monday, July 16th! The linky will be live for 3 weeks, so if you aren't ready to post on the 16th... just join in when you can! I can't wait to see what you create!! Last month's posts were amazing! Feel free to add our July Book Club button to your post if you are joining in this month!! Just copy the html code in the box and add it to your blog post. Looking forward to this month's books. I love introducing my girls to new-to-us authors! I enjoyed participating in the Mo Willems book club last month. I'd like to try this one too! Ooh! I love Don and Audrey Woods' Alphabet books. My kids love to look for the dot from little "i" in Alphabet Adventure. We had wanted to join in for June, but the month got away from us. Hopefully we'll be able to fit in some activities for this month! Do you need to know which book we will be sharing? If so, I plan to do Sweet Dream Pie-- is that okay since Don did not illustrate it? Otherwise I will do King Bidgood's in the Bathtub. Thanks for you help. This is my first time doing this! Feel free to do a book by either of them... doesn't have to be done by both of them. So glad you are participating! Excited to see what you come up with. I'd love to join it! I would love to join along too. I love their books and am excited to share them with my little man. 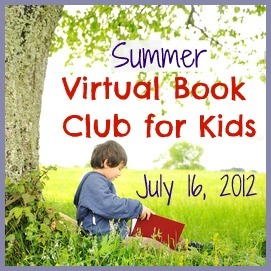 We loved June virtual Book Club and would like to participate in the July one too. It is so interesting to see how many ideas one can come up with it. Now looking forward to know more about Don and Audrey Wood books trough the blog hop. I'm in! Love the Wood's books! Just ordered some books so we can join in! This is great! I would love to join! I manage 3 kids' book clubs for my kids and would love to share our book club ideas. I freaking LOVE King Bidgood's in the Bathtub.